Did you know 1 in 5 children in the U.S. has at least one decayed tooth? Do you know how to care for your children’s dental health? The American Dental Association (ADA) sponsors National Children’s Dental Health Month to raise awareness about the importance of oral health. This February, celebrate National Children’s Dental Month with these dentist-approved tips. It’s important that parents help children establish a routine of oral care at a young age. Even before the first tooth makes its appearance, infants possess a full set of fully formed teeth beneath the surface of their gums. Children should see a dentist as soon as their first tooth erupts, or by the age of one. Additionally, an initial visit to the orthodontist is recommended no later than age 7. Children’s dental health begins early. Before your child has teeth, wipe your their gums with a bit of wet gauze or clean damp cloth after each feeding to clean away harmful bacteria. When the first teeth erupt, start brushing with a soft infant toothbrush and water. Around ages 2 to 3, teach your child about proper brushing techniques and the importance of keeping their teeth clean. By age 6, most children will have developed the skill to brush their teeth alone. Until then, you should follow up your child’s brushing efforts by brushing their teeth again to ensure all plaque is removed. Teach your children to not swallow toothpaste but to spit it out and rinse afterward. Introduce flossing as soon as teeth touch each other. 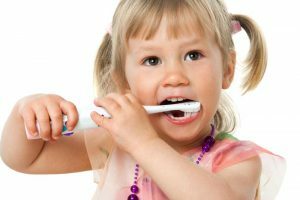 You should continue to monitor your child’s oral hygiene until age 10-12 even if they can independently brush and floss. Fluoride helps protect against tooth decay by encouraging tooth remineralization, hardening tooth enamel, and preventing bacterial growth. Use a pea-sized dab of fluoride toothpaste when brushing. Use of sealants (applied by your dentist) on the back teeth prevent decay by filling in the groves and crevices with a thin plastic coating. They keep food from lodging and cavity-causing acid from reaching the tooth. A bite of chocolate from your Valentine’s heart-shaped box might be a nice treat for a child. However, eating between meals damages your kids’ oral health. Snacking increases the risk of cavities because it takes saliva a minimum of 30 minutes to neutralize the acidity created by decay-producing bacteria. If you choose sweets to snack on, a lot of residual sugar sticks to the surface of the teeth. This excess sugar fuels harmful oral bacteria that erode tooth enamel. If your child must have candy, sugar-free gum is a good choice. Common sense says to avoid sugary foods and carbonated drinks. Here are some suggestions for nutrition-dense, smile-friendly snacks. Encourage your child to drink plenty of water too, especially after eating candy. This will help flush out excess sugars and food particles that remain in the mouth. Help your child develop good habits at an early age for a lifetime of healthy teeth and gums. Schedule an appointment for a dental visit today!